KIM: A grandson of reclusive North Korean leader Jong IL Kim arrived in Bosnia on Wednesday 12th October 2011 to study in an international school for the next two years, a police source said. A border police spokeswoman said 16-year-old Han Sol Kim entered the country at Sarajevo airport Wednesday afternoon on a regular flight from Vienna. "A North Korean national arrived at 2.20 pm (1220 GMT)," according to local border police spokeswoman Sanela Dujkovic. Dujkovic said the "passenger had a valid visa and passport," thus satisfying all conditions to enter the country. Bosnia-Herzegovina - Officials in Bosnia said North Korean leader Jong IL Kim's grandson has arrived in the country to enroll at a private high school made up of international students. He will be the first student from North Korea to attend the United World College's branch in the southern city of Mostar, school spokeswoman Meri Musa said last week. In some nations, a college is equivalent to a high school. Musa said that Han Sol Kim will be treated like all other students and will be living in a dormitory. The United World Colleges (UWC) in the Bosnian town of Mostar said last month it had accepted Han Sol Kim as a student. According to the school, the enrollment of the grandson of the leader of one of the most secluded countries in the world was the result of a special outreach program for North Korea the UWC network has. Media reported that the 16-year-old's father is Jong Nam Kim, the North Korean leader's exiled eldest son. The couple is said to have lived in Macau since the father fell out of favor with Jung IL Kim 2 years ago. Jong Nam Kim the father of Han Sol Kim is said to be weak as he tried to oppose his father's decision Jong Il Kim in ruling the communist state. Jong Nam preferred to rule the North Korea with democracy opposite to his father's want for a total authoritarian system. Analysts said if Jong Nam will be the successor of Jong IL Kim then it could be the end of communist country as He wants to give more freedom to the North Korean people than controlling them. Jong Nam Kim is understood to have once been the one to beat to succeed the North Korean leader. But the youngest son Jong Un Kim is now being groomed to take over one of the world's most isolated countries. The UWC is a network of school and colleges throughout the world, attended notably by pupils from war-affected areas, and aimed at promoting international and intercultural understanding. The southern Bosnian town of Mostar was the scene of violent clashes between the country's Croats, Muslims and Serbs during its 1992-1995 war. Sixteen years since the end of the war it still remains a symbol of inter-ethnic divisions in the Balkan country. 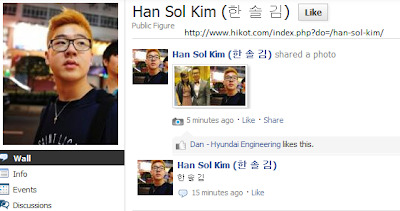 Many people are concern about the security of the young boy (Han Sol Kim) in Bosnia as several activists around the world hates the government of Jong IL Kim. Many are worry that the innocent boy would be a victim of discrimination or abuse as his grandfather is known of his communist government. Even though Han Sol Kim is a grandson of the communist leader in the North Korea, it doesn't mean that he has a reclusive attitude as even his father was exiled to Macau for opposing his father's system of government.